Douglas Mayo reviews Jersey Boys now playing at the New Victoria Theatre Woking as part of its current UK tour. Jersey Boys is the musical re-telling of the story of Frankie Valli and the Four Seasons from their starts in the New Jersey projects to their induction into the Rock and Roll Hall of Fame. It’s an incredible story of four guys who defied the odds and made some of the most memorable music of the past fifty years. The genius and basis for the show’s enormous success worldwide (aside from the talent) is Marshall Brickman and Rick Ellice’s incredibly well-structured book for the show which splits the story into four enabling each of the main characters to be a narrator of a particular section of the show and in doing so giving several unique perspectives that ultimately make this tale compelling viewing. As Frankie Valli, Dayle Hodge was dynamic and delivered a character imbued with integrity. Valli’s voice is a unique instrument and Hodge was able to attack the material with impressive vigour. His rendition of Can’t Take My Eyes Off You bought the house down. How he does it I don’t know but it’s certainly impressive. Aussie import Declan Egan brings the charm of Bob Gaudio to the stage with an impressive ease. His scenes with Hodge more than adequately gave you an understanding of just how his friendship with Valli has lasted all these years. With a rich voice and slightly geeky presence in some of the earlier scenes Egan’s Oh What A Night was a joy. Simon Bailey’s Tommy Devito is suitably narcissistic. Completely out of his depth, his bravado and honest belief in himself even whilst sinking into a financial quagmire is a part of what makes this story incredible. It would be easy to simply play Devito as the baddie of the piece by there’s a nice balance there that gives the audience an understanding of a complex character. Lewis Griffiths perfectly inhabits Nick Massi. With a gorgeous deep bass voice that perfectly blends into the harmonics of the early material, it’s an interesting examination of a very unusual man. Together, they create some amazing music, hit after hit roll out during the telling of this story. You forget just how many songs have become standards. The show’s narrative device of removing the fourth wall allowing each of the members of the band to tell the story directly to the audience allow the audience to become investing in the telling. Musically, you can’t fault this production. Francis Goodhand’s small ensemble supplemented by some of the cast at various points perfectly compliment the vocals and with the help of Steve Canyon Kennedy’s sound design not a word is lost whilst maintaining an almost concert-like feel to the proceedings. My only comment would be that the first twenty minutes or so, felt a bit rushed. I know that the story doesn’t really take off until the Four Seasons are established but some dialogue scenes were lost and unintelligible early on. Once we hit Sherry though we were in good hands, comfortably reliving memories and enjoying some incredible music. All-in-all Jersey Boys is a rather slick affair. 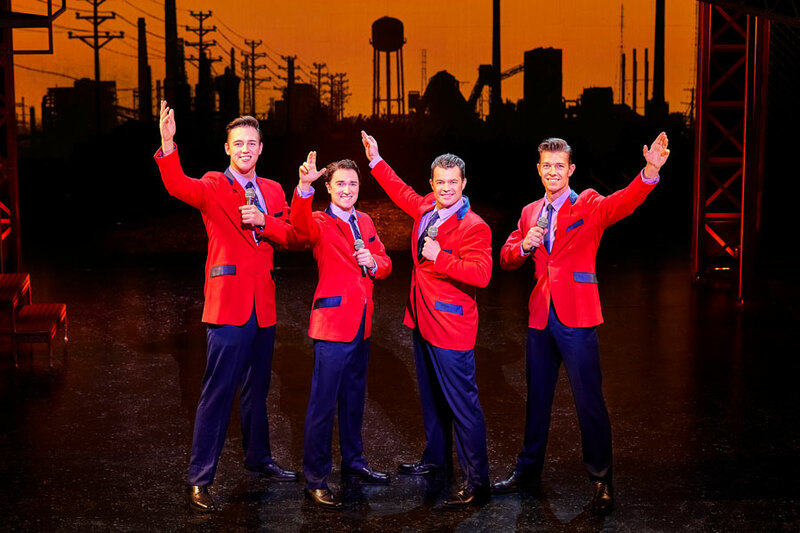 Des MAnuff’s direction and Sergio Trujillo’s choreography maintains its integrity on tour but ultimately it’s Hodge’s phenomenal vocal that really makes Jersey Boys on tour worth seeing.